My thoughts on all things WoW! Hello again! Its been a while. I haven’t much time or inspiration to blog, but I had an idea pop up today! Today, while dropping off my preschooler, I was asked by a fellow mommy about the sticker on my back window. 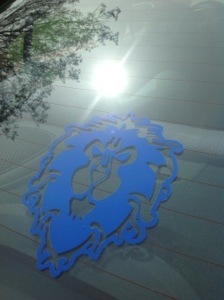 Yes, I have an Alliance sticker on my car and I have no shame about it! Well, when I told her what it was for, she gawked at me like that was the dumbest thing she has ever heard. Right there, in that parking lot, I became a social outcast. Now I am an introvert. I am quiet and keep to myself most of the time, but I love to help when I can. I volunteer at any events or activities at my daughter’s school, not just to support her school, but to support her. Today I was just trying to drop my child off so I could go help my mother in law in her classroom. Many of the women I have worked with are very friendly and always greet with ‘hellos and smiles’, but I don’t think many of them know my name or remember my face. I’m used to it though. Being the quiet person I am, I often have to reintroduce myself because I don’t always leave an impression. In my head, its scary to put myself out there! I don’t know why this lady felt compelled to bash something I enjoy, right in front of me. I don’t do that to other people. I don’t judge people based on what they enjoy doing or what kind of music they like. I think its rather silly. Everyone enjoys something different. What you might find is a waste of your time, I find to be worthwhile. This isn’t the first time I have run into situations like this. I used to hide my nerdy side, until I came to terms with the fact that I am who I am and if someone doesn’t like that, then they wouldn’t be worth wasting my time on. Have any of my fellow blog readers had an issue like this? I’d love to hear about it! This entry was posted in gaming, gaming mommies, world of warcraft, WoW. Bookmark the permalink. The whole “oh I’m a grown up, I have no clue about video games” thing really annoys me. I’m in my mid-50s now and I started playing video games in the late 1970s before I went to university. It’s just ignorant to pretend that the last four decades didn’t happen but the number of people twenty or thirty years younger than me who still act like video games are something that was invented yesterday and that only someone under 16 could possibly understand is bizarre. I figure playing video games is very similar to watching tv. Both take your time and attention. The difference is that video games can hone actual skills, rather than just sitting there. Yes, the school gate thing is a different topic for sure. I used to be on the other side (teacher assistant). I would much rather be in contact with those mothers as their child’s teacher than to try to be in their clique. Chin up. These people live in a very fragile world. Leave them at peace for now. And keep your kids safe from them! You are exactly right sir! I wont let her get me down at all. I just wanted to see if other gamers have experienced something like this as well. Hugging is only for girls!? Seriously? I sometimes think the trick is to act as if it were perfectly normal and accepted. “Yes, I play video games. They keep my brain more active than watching television! It’s fun and relaxing. Like all hobbies, it’s just a question of time management to get everything done.” And then just drop the subject, since they patently don’t share the interest. Easier said than done, sometimes, of course. Can’t stand small-minded people who feel the need to put down others to make themselves feel better, and often can’t bring myself to make the effort to make small talk with ’em. LOL, I have to laugh at some of the people that feel the need or are ignorant enough to insult someone because they don’t share the same interests. No worries, I’m one of the people that does what they wants to do. I’m not into soaps and OMG, I can’t stand Dr. Phil. As for the hugging thing – just be careful with that because I was reading a newspaper not long (doesn’t happen often) and there was an article in there about a little boy that was suspended from school for “sexually harrassing” another student by hugging them. Geez!! That was sad. Just discovered this blog now (I know, I’m late to the party) and I can so recognize this sentiment. I may not be a mum, but I’m a woman and if I mention to people that I like gaming they always look at me as if I’m really weird. It’s quite rude actually. I didn’t really tell everyone I was writing a gaming blog at first. Only when I thought about it and concluded it was ridiculous to be secretive about it I realized what I was doing. I sometimes get the feeling that when a man games that’s just normal, but if a fellow woman games, she’s being irresponsible and is ‘wasting her time’. And then it’s mostly women who judge like that. Seems like we have a lot to learn still. Then again, it seems like it’s a reflex for (some) people to react negatively to things that derive from their expectations. I try to do better myself.